TechSideline.com will be highlighting the five baseball seniors as they give it their last run in a Hokie uniform. Virginia Tech opens its season on February 15 at Stetson. Virginia Tech found a gem on the junior college recruiting scene when Luke Horanski joined the Hokies last season. After spending two years at Creighton University and one year at Cisco Junior College, the Canadian found his home Blacksburg. 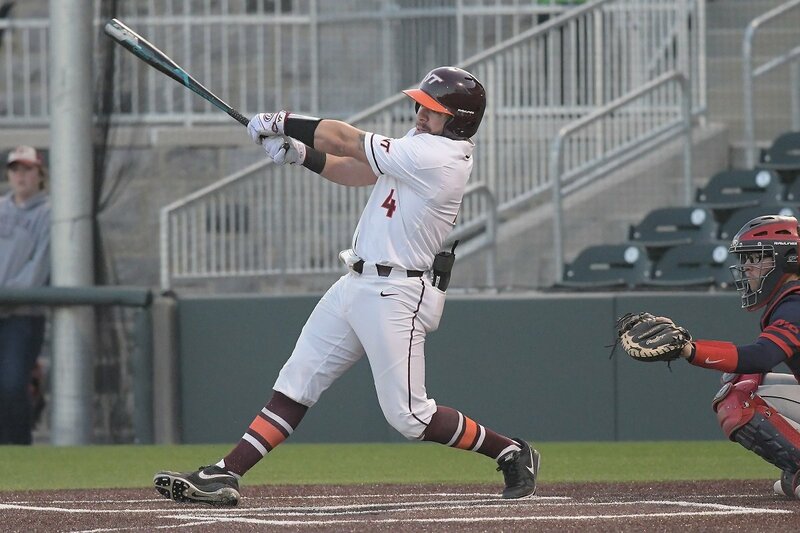 The 6-foot-1, 225-pound catcher led the Hokies with a .314 batting average and .436 on-base percentage in 2018. Horanski will be a key cog in the middle of Virginia Tech’s lineup in 2019. Q: If there was a movie made about Luke Horanski, who would be cast for your character? LH: I don’t really know many actors. Let’s go Liam Neeson. Q: What’s the best thing to do in Canada? LH: Well it’s pretty cold and there’s a lot of ice, so it’s probably got to be something to do with that. Just because it’s the national sport, let’s go with play hockey. Get on the frozen pond and let’s go shoot some pucks around with the boys. Q: Favorite thing to eat on campus? LH: The only real place that I’ve eaten is West End, and every time I go there I get steak and potatoes. Q: What’s been your favorite memory over your time at Virginia Tech? LH: Even though the games didn’t go that well, I’d say the leading up to opening day last year just because there was a lot of excitement being with the guys and being with the new team. Opening night at the ballpark here. Just having the stands full and everybody out here supporting you. Neither of those games went very well, but just the atmosphere pregame for that, obviously we wanted a different result, but the atmosphere pregame for those two games was really exciting. Q: Who is your favorite pitcher to catch? What pitch are you calling from him with an 0-2 count on the batter? LH: I’ll go with (Ian) Seymour. Especially if there is a right hander in the box, I’m going with his changeup. He’s got a nasty changeup. I’ve never really seen anybody put too much barrel or good barrel on that changeup, so I’m feeling pretty confident in that one. Q: What’s the hardest part about being a catcher? LH: Probably just the mental grind of trying to balance offense and defense. When you’re back there all the time nine innings, day-in and day-out, it kind of wears on your legs and wears on you mentally. Staying mentally strong for the most part, and trying to balance offense into that as well. I like to think that I’m a big part of the offense as well. Just having those two things and being able to separate them when one is not going so well. Q: Where do you want to see improvement in your game defensively as a catcher? LH: Obviously, receiving is the biggest part. You can always get better at that, so I’ve been doing a lot of things. Just different stances and trying to get myself in a better spot to catch more strikes. A big proponent that I’ve been working on this fall is my throws. I didn’t throw out many runners last year. That was definitely something that I wanted to improve upon, so coach Hanson and myself are worked tirelessly on that. Just getting my throws on the bag and getting my body in a comfortable position where I feel I can release it quick and efficiently every time. Q: The responsibility falls on you to be the vocal leader this year in a sense. How do you handle that, and is that a responsibility you value and enjoy? LH: Absolutely. I think the leadership role has always been something that’s a part of me ever since I was really born, especially through baseball being the catcher. That’s something that you want. You want that leadership ability and the guys to count on you and lean on you. This being my last year, I know I was a vocal leader last year as well. I just try to take an even further step up with that, and as far as letting the younger guys, we have about 20-something new guys this year, just letting them know, ‘Hey, these are the ropes. This is what we need to be doing. These are the right things to do. These are some of the things we don’t need to be doing.’ Just trying to keep everybody even-keeled and on the straight and narrow. I’d say it’s definitely something that I like to do a lot and kind of what I think is the most valuable part about me. Q: You led the team with a .314 batting average last year. What have you been working on with Coach Elbin in the offseason to bump that up a notch? LH: You always want to improve. First and foremost, I want to finish the season this year. I had the head injury at the end of the year last year. If I can stay through the whole season and play through the whole thing, that would be great. Just kind of getting my power numbers to go up a little bit. I’ve got extra base potential. I hit a lot of doubles last year, but not as many homers as I would have liked. You’re always working to keep the strikeouts down and the walks up. That’s something I’ve done a fairly decent job of in the past, but improving upon that. The biggest thing for me is keeping the average and on-base where it needs to be, and trying to pump up those power and RBI numbers is definitely a thing that I’m working on. Q: How do you want people to remember Luke Horanski when you take off the Virginia Tech jersey for the last time? LH: The energy guy. The spark plug. A great leader. I just want to be someone they remember as being a guy who went out there every day and gave it his all no matter the conditions or what was going on. Good game, bad game, 0-for-4, 4-for-4. Just the same kind of guy every day that stayed present the whole time and really led by example and led vocally at the same time. Sounds like a great guy, hope he and the Hokies have a good season.